Ted thinks he knows where this one is - but would like an independent assessment. Any thoughts anyone? Cambridge. This shed (sub-shed to Bletchley) closed in December 1935 but engines still stabled there as late as 1939. In the background is LNER Class B17 No. 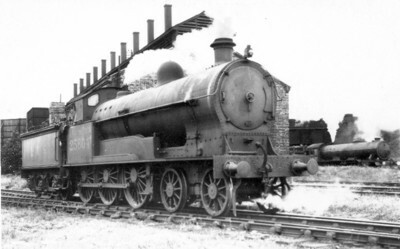 2817, "Ford Castle" which was a Cambridge engine. From other photographic evidence, I think this is Cambridge. Yes, definitely Cambridge, with Hills Road Bridge showing to the right of the shed. You may be interested in this view of the shed taken in 1948 by my late father, John Ford when he was an undergraduate at Cambridge. It shows the shed from the other side, clearly at least the yard was still in use.